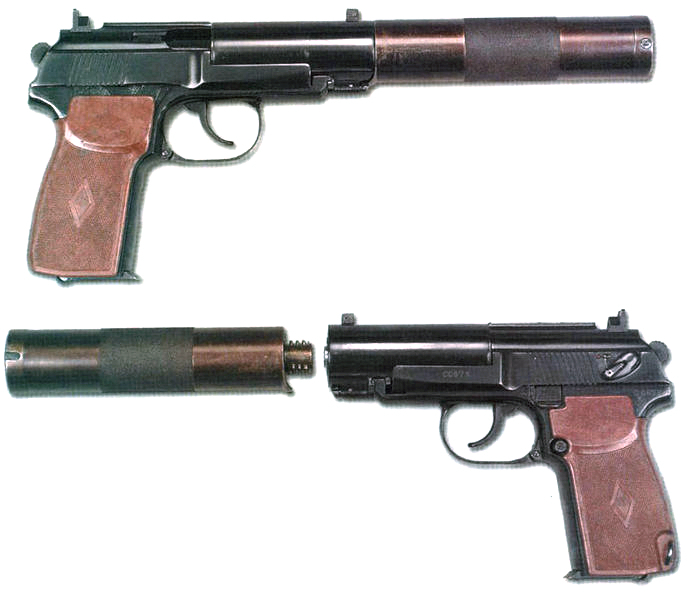 At left, a Russian silenced pistol provided with a waiver of all rights under the creative commons license on wikicommons. The pistol is a suppressor equipped version of the Makarov used by the Soviets as general sidearms for police and a litany of others from the early 1950's through 1991. It will kill. It is brutally simple in construction. It weighs slightly less than you think it would if it were cast of lead. The blowback action makes the slide really heavy. Other than that, the pistol qualifies as a POS. At under twenty yards (the range for which pistols should be employed), it works just fine seven days a week. The Soviets weren't idiots. It was manufactured in typical Soviet style: large numbers. It is a simple device. It operates in single and double action modes. Drop it and the floating firing pin will cause a discharge some of the time - especially if it is dropped on its barrel. For the safety conscious, don't be dropping automatic pistols. Arguing they are dangerous when dropped is exactly the same as arguing that your chef's knife is dangerous when accidentally used on your husbands. I show this pistol here because these little gems were used by the security services and a great many of these pistols are finding their way around the world. You can't walk into a commercially reputable store and buy the silenced version. You can however find them for sale. Need a cheap rugged weapon for your killer? Then this is it. It does not shoot regular 9mm ammunition. It shoots Soviet and Bulgarian made ammunition. You can have some fun with the Bulgarian variant. The East Germans manufactured ammo too though I doubt any of that is commercially available. So, need to give your killer a suppressed weapon for use backstage at the opera? This is your choice today. The countries of origin do not exist so technically these are treated like antiques and not as production weapons. Scary fact, that. Anyway, there is always the need for a killer to have access to a suppressed weapon that isn't precious enough so that discarding it is a concern. Here you go. Say, $1000 worth. More fun, have the bullet traced to the Soviets and give the gun a history. I'm sure the CIA can tell you if this particular gun was used to shoot a British operative in South Lebanon in 1983. There are always concerns about exotic weaponry and the possibility of obtaining it. You can put this baby in Auntie Marge's handbag, have her shoot that two-timing bimbo Sara Ramsbottom, and toss the thing in the creek. She'll still have money in the fund to buy cat food. Dogs won't even bark when it is fired. You can hear it, but it isn't as loud as a hammer strike on a two-by-four on Sunday morning. I hope your silence is merely restful and not of the deadly variety. For some of my characters, that is not the case at all. Don't open the door Martha. Don't do it.